TechBargains.com, a deal aggregation website for electronic products, released its Back-to-School survey results revealing that nine out of ten people plan to shop online and 95% expect to use coupon codes this year for back-to-school purchases. The survey conducted on TechBargains.com canvassed the views of nearly 1,400 respondents and found that 36% of people anticipate spending more this year than last with the majority (57%) saying it’s based on schools requiring more, not because they have a larger budget or want to purchase more back-to-school items. The survey results indicate that 3 out of 4 people plan to spend less than $500 on back-to-school shopping, 23% expect to spend $100-$199 and 18% plan to spend less than $100. Additionally, the majority (60%) of people said they plan to begin back-to-school shopping in August followed by 27% of people who began in July. 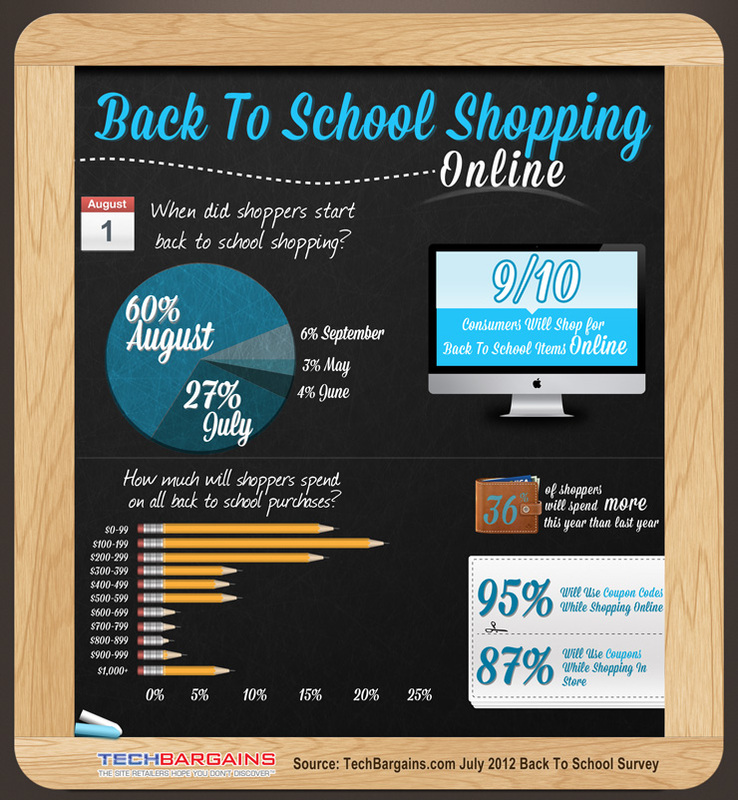 A TechBargains.com infographic illustrating how people said they will be back to school shopping this year can be found here. The survey was conducted on TechBargains.com and had 1,393 respondents. TechBargains.com provides additional helpful resources for consumers with their Back To School Gift Guide featuring exclusive deals and coupon codes on computers, tablets, clothing and more. TechBargains is a deal aggregation website that combines expert curation and a real-time price-value discovery algorithm. TechBargains uses this technology to highlight the best deals and coupon codes on the internet each day. TechBargains is a division of Exponential Interactive (http://www.exponential.com), a global provider of advertising intelligence and digital media solutions to brand advertisers headquartered in Emeryville, California that offers solutions in 26 countries worldwide. For more information visit http://www.techbargains.com.